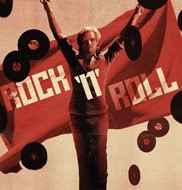 Opening in Melbourne in late February, Tom Stoppard’s ROCK AND ROLL, opened at the Sydney Theatre April 14th. It is sad to realise that this is the first new play by Stoppard that Australian audiences have seen since ARCADIA some 13 or 15 years ago. This is what? The result of the Impoverishment of the Arts in Australia? Impoverishment of Financial Support or Intellectual Thought ,or Artistic Vision? I hope it was the first. We recently had Mr Stoppard in Sydney to give a talk. It was a full house with an eager audience. How embarrassing that we have not been even able to give a reading of THE INVENTION OF LOVE or THE COAST OF UTOPIA trilogy .Two works of arguably the greatest living theatre writer in the English speaking world neglected by our theatre companies. The former has a cast of nineteen and the latter a cast reaching into the thirties and nearly nine hours long .That must be the reason we have been deprived!!! We haven’t the financial wherewithal to mount such an offering. Not on Intellectual or Artistic reasons, surely ? ROCK AND ROLL was not a disappointment. Stoppard is as challenging as ever. Sappho , Marxist philosophy, Czech-Russian politics and the contemporary music world of the Sixties into the Seventies embracing Syd Barrett to the Czech band The Plastic People of the Universe along with a deeply moving human story of love, suffering and death means you have to have your senses fully alert when you enter the journey of the performance. Difficult, bracing and very rewarding to experience. Simon Phillips the Director, has a good handle on the play and along with his Designer Stephen Curtis, Lighting Designer Matt Scott and the Audio Visual Design by Josh Burns it is a fairly clear execution of the play. The lighting had a huge rock concert like rig that flew up and down in the scene breaks, sometimes masking the audio visual history : politics and music projected onto a huge screen at the back of the set. I felt longeurs of pacing in these moments, too long, to much time to become distracted with the frustration of trying to see what was being projected while the rig ascended and descended. All the actors give assured performances. William Zappa as Max, surely the best actor performing in Australia at the moment, is as always clear, intelligent, emotionally engaged and communicatively alert to his audience. Matthew Newton as Jan holds his own, even though vocally it is just a trifle too narrow in range for such a long role. But best of all is Genevieve Picot in the Eleanor/Esme double. Here is an intelligent and deeply moving performance. The full grief of approaching death in the first act is devastating to experience and the sheer subtle yearning of love in the second act strikes a chord of shared knowledge that the audience is grateful to have expressed for them. At least I did. This was a rich performance beautifully judged and controlled. Is there something still unsolved about the acoustics in this relatively new space , The Sydney Theatre? In my seat, K33, in the stalls, it was difficult to always hear. Other friends in the front of the upper circle also had difficulty. The great problem of all new spaces: The Acoustic design. When I think back most of the successful performances have used microphones. Not a permanent solution, I hope.